Coming from Michigan State University, he will begin Oct. 1. 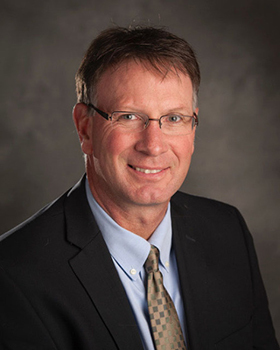 Dan Grooms, professor and chair of the Department of Large Animal Clinical Sciences at Michigan State University, has been appointed the next Stephen G. Juelsgaard Dean of the College of Veterinary Medicine at Iowa State University. He will begin Oct. 1. Grooms, an expert in bovine infectious diseases, earned a bachelor’s degree in animal science from Cornell University and two degrees from The Ohio State University — a veterinary medicine degree and a Ph.D. in veterinary preventive medicine. He joined Michigan State in 1997 and was promoted to his present position in 2014. Grooms also holds board certification from the American College of Veterinary Microbiologists, with specialty in veterinary virology; is a former president of the American Association of Bovine Practitioners; and has served on the U.S. Secretary of Agriculture’s Committee on Animal Health. In making the announcement, Senior Vice President and Provost Jonathan Wickert thanked Interim Dean Pat Halbur for his leadership of the college, and members of the search committee for their thoughtful consideration of candidates.